Vegetable that grows in damp cool places; its edible varieties are served as condiments or as an ingredient in a variety of foods. 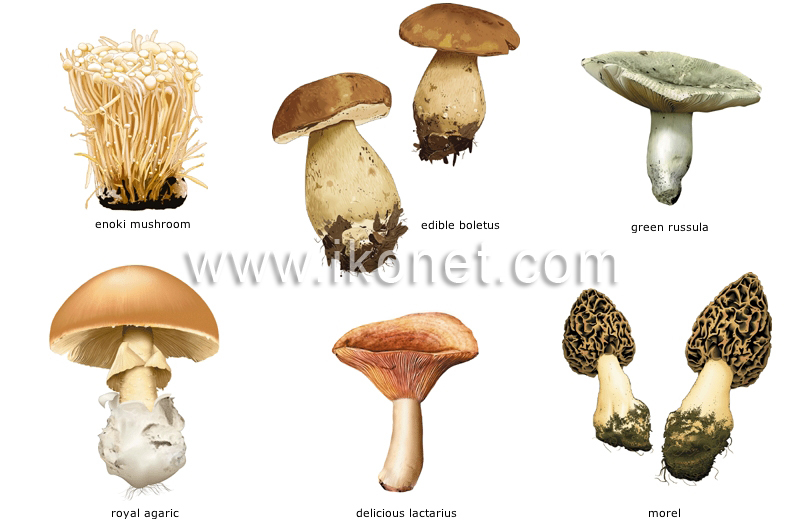 Long-stemmed, soft-fleshed resistant mushroom very popular in Asia; it is eaten raw, in salads, or cooked, in soups and Oriental dishes. Squat, it can grow up to 25 cm in height and diameter; it is usually cooked in oil, braised or served in an omelette. Its white brittle flesh has an aroma of hazelnut; it can be eaten raw or cooked, preferably grilled. Secretes an orange milk when broken open; it is used primarily in spicy sauces, especially in Spain and the south of France. Equally flavorful raw or cooked, it has been famous since ancient times; it is not to be confused with the poisonous fly agaric, which it resembles. The darker the specimen, the more flavorful its thin fragrant flesh; it should be thoroughly cooked to eliminate toxic substances.